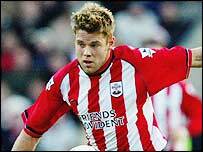 Southampton chairman Rupert Lowe has dismissed claims linking striker James Beattie with a move to Charlton. The club's top scorer last season had also been linked with Newcastle until they signed Patrick Kluivert last week. "We don't want to sell Beattie and we are a bigger club than Charlton so it would not make any sense," Lowe told Southampton's website. "I think Beattie's agent has been busy but he is a Southampton player and we want it to stay that way."